*My morning started very early. My alarm went off at 3:30 a.m., because I had a VIPKID class scheduled for 4:30 a.m. When I got downstairs to my classroom and turned on my computer, I saw I had a student signed up to do the trial class. A trial class is one where a student is trying out the VIPKID program to see if they want to use it. I was not familiar with this particular level I would be teaching, so I quickly found the slides and went through them, gathered some props, and prepped as best I could. At 4:30 a.m., the class started, and I taught a girl named Coco. She was 11, and did very good with the material presented. I received a “5 apple” rating from her parent, which in VIPKID world is the best rating you can get!! The experience taught me a lot about what I know, what I need to improve on, and how I can prepare for more classes in the future. *Waking up at 3:30 a.m. through off my rhythm for the day. Plus it was kind of hot, too. But I spent a lot of the day working on VIPKID things, I harvested vegetables, and watched some TV. Between these things, I slept off and on. 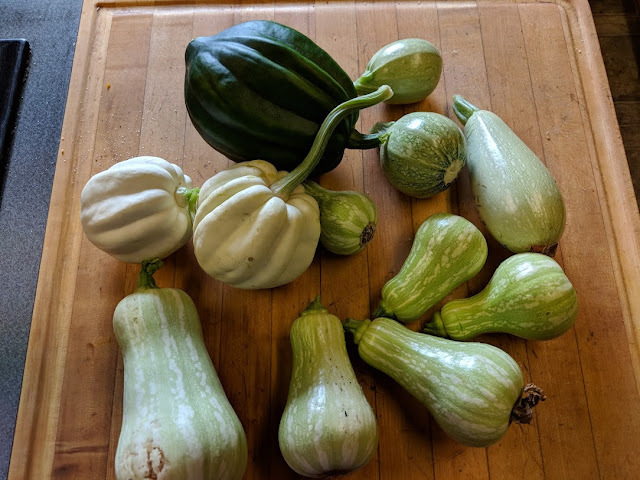 It was fun going outside to see what I could harvest, and dug through my squash patch that is taking over the side yard, and picked some acorn squash, one black and two white, some summer squash that look like a cross between a butternut squash and a zucchini. I also picked more zucchini in my raised bed, and actually found a good sized cucumber. Earlier this summer, I was a bit forlorn about how my cucumber plants were not doing well, but they have now rallied, and I may get quite a few cucumbers. Later in the evening, Paul and I picked some radishes from our radish bushes growing in the garden. *It was fun preparing a stir fry for lunch that included mostly ingredients from the garden. I sliced up zucchini, pea pods, radishes, tomatoes and mushrooms. It was really good. We also had some cucumbers and tomatoes as a salad. *Paul grilled some steaks for dinner, and sauteed some mushrooms in butter to put over them. I went out and picked a variety of salad greens, and made a nice salad with greens and tomatoes. It was a really delicious dinner.